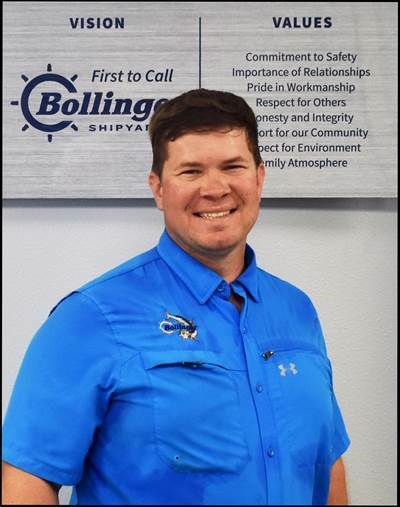 Louisiana based shipbuilding and repair group Bollinger Shipyards, LLC, announced it has promoted Matthew Kuehne to General Manager of Bollinger Quick Repair. Kuehne joined Bollinger in 2011 and has held the positions of Assistant Estimating/Project Coordinator, Estimating/Project Coordinator, Assistant Operations Manager and Operations Manager. He is a 2007 graduate of the University of New Orleans. Bollinger Quick Repair (BQR) is located on the Harvey Canal .5 miles west of the Mississippi River at the Harvey Locks. BQR is a full-service shipyard and provides service to both inland and offshore marine transportation sectors with five drydocks ranging from 1,500 tons to 3,400 tons, on-site machine shop, armature shop, propeller shop and access to all Bollinger support facilities.